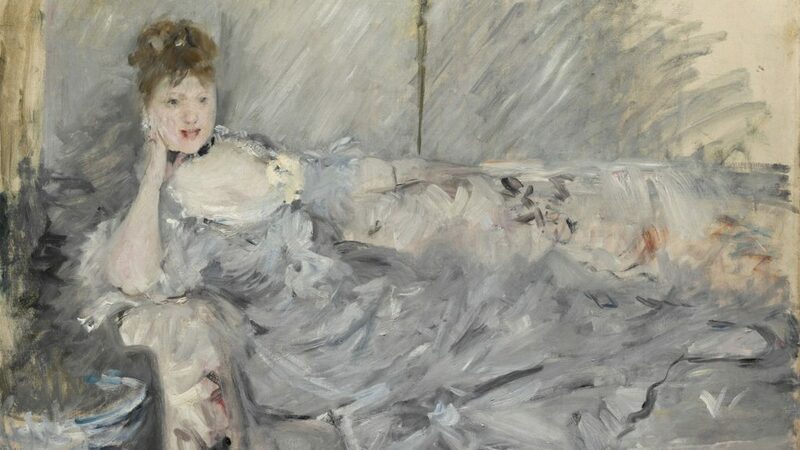 A trip to the museum to see paintings by Berthe Morisot, a French Impressionist, left me reflecting on the similarities between good journalism and a good art exhibit. Both shine a light on people or situations that need more attention–not only because they deserve it, but because they’re important to the collective consciousness. Morisot was a respected contemporary of Manet, Renoir, Degas and Monet–leading figures in the Impressionist movement whom we revere to this day–but Morisot has been largely forgotten and overlooked in the years since her death. How does this happen? Berthe Morisot died suddenly in 1895, from pneumonia. She was only 54, but she left behind a significant number of paintings. How does she get overlooked? Berthe did not grow up on the wrong side of the River Seine. She was neither a starving artist, nor a despised person, nor did she choose an unsuitable man to marry. Au contraire. She was born into the upper middle class. She was beautiful. At 23, she was invited to exhibit two paintings at the Paris Salon, the annual show of new paintings selected by the French Academy of Fine Arts. Her work impressed Edouard Manet, who even used her as the subject of a number of his own paintings, and she later met and married his younger brother Eugene, a painter who gave up his career to support hers. She was invited in when the Impressionists organized their first independent art exhibition in 1874. And invited in for all of their eight exhibitions. She missed only one the year her daughter Julie was born. Malcolm Gladwell has a podcast called Revisionist History. A couple years back, I listened to the first episode of Season 1, “The Lady Vanishes.” In 1874, the lady–Elizabeth Thompson–took the British art world by storm with “The Roll Call,” a war painting that was different than the others in that it showed a haggard line of soldiers after a battle, some clearly wounded or exhausted. “The Roll Call” was selected for the Royal Academy’s annual art show in London, one of the biggest events of the day. It was hung in a prominent gallery, and hundreds of thousands of people lined up to see it. The painting was sent on a tour of England. A bidding war broke out, and Queen Victoria, one of the greatest art collectors of the time, decided she had to have it. Elizabeth, still in her 20s, became a celebrity. She was so famous that for her next painting, the British army arranged for 300 men to pose for her in battle formation and repeatedly fire their weapons. “Quatre Bras” made it into the Royal Academy’s art show the following year, but this time the men in charge (40 elected Royal Academicians–painters themselves) stuck it away in a back gallery, an undesirable No Man’s Land. Elizabeth’s next painting, “Scotland Forever,” which many art historians consider her greatest work, never made it into the Royal Academy’s art show. And yet, because of her talent and celebrity, Elizabeth Thompson was nominated to be a Royal Academician in 1879. She lost by only two votes and people thought she’d easily win election the next time around, but it never happened. She married a military man and became Lady Butler; her career took a back seat to his. But here’s the part that boggles the mind. When her husband published his lengthy memoirs, he never mentioned his wife’s success, only that he was married with six children. What about the 300 soldiers who posed for long hours just so Elizabeth could paint another masterpiece? The Berthe Morisot Exhibition that I saw at the Dallas Museum of Art is there until May 26, but it’s part of an international collaboration to increase awareness of this important artist. The exhibit started in Quebec (Canada’s first solo exhibit of her work), then travelled to Philadelphia last fall. In June it will conclude at the Musee d’Orsay in Paris, the first time since 1941 that a French national museum will devote a show exclusively to Morisot. It’s not that she’s unknown in France. Sometime after her death, the family donated a number of her works to a Paris museum, the Musee Marmottan, which houses a permanent collection of her work. But the 19th century sexism that existed during Morisot’s lifetime has had a trickle down effect. This new Exhibit is the first solo presentation of her work in the U.S. since 1987. Artists like Berthe Morisot and Elizabeth Thompson are important to the collective consciousness because women offer different perspectives. Just as men do. One is not better than the other, but combined they offer a more informed whole. Both genders need role models. How many famous women painters roll off the tip of your tongue? Speaking for myself: Georgia O’Keefe, Frida Kahlo and Mary Cassatt. If I were to make a list of famous male painters, this blog would be much too long. Morisot’s family and fellow artists did not forsake her. A year after her mother’s death, 17-year-old Julie, with the help of good friends like Renoir, organized the largest art show to date of her work. Her husband had died three years earlier, but her friends did not forsake her. Only history has forsaken her.